We had an old and ugly closet. 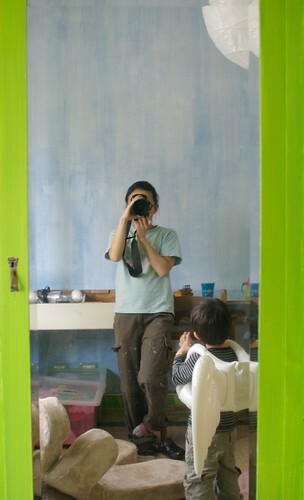 We painted it green and called some sky on the wall, so Spring is always here. 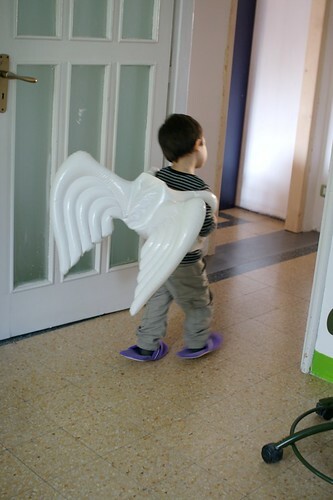 - Mama had a pair of wings too, but it was once upon a long ago. I ate so and so much: a chocolate cake, sausages, three apples, an ice cream, strawberries... and like the hungry caterpillar, I became a butterfly. - Where are your wings now? - A sudden morning, I woke up: my wings were not on the back, but on the floor. From that day on, I could not fly anymore. You have your wings now, you can fly. Don't be afraid, I'll be here. Go, my dear, before your wings fall! R. loves that her mum was a butterfly... believing or not, it is not important. And I love how his eyes stare at me when I tell this story. Very beautiful, but a little sad, it is life, we can truly fly when we are children, it's the truth. LE MIE ALI E IL MIO ORSO!! !